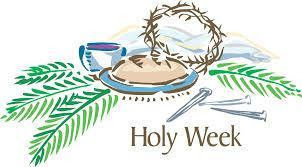 Holy Week is the most significant week in the life of the Christian Community. Sermon: "The Road to Jerusalem"
Choir Anthem " Wave the Palms , Hosanna!" the "Seven Last Words from the Cross"
Choir anthem: "Behold Him in Dark Gethsemane"
Choir Anthem "Alleluia,,He is Risen"